Calabria was once a Greek lake, where one could not move around, nor through the entire south of Italy, without being able to speak the Greko language. This was a comment made to me by Calabrian doctor and one-time Canadian resident, Dr. Pasquale Poriglia in 2002 as he translated on behalf of his friend and Greko speaker, Carmelo Nucera. When I met up with him again in Reggio di Calabria recently, Pasquale made a similar comment to me. Calabria, being the home of the onetime formidable ‘Greek lake’, is a place with a Hellenic heartbeat and soul with almost 3,000 years of Greek history. The lake is perhaps greatly reduced in size, but the history and Greek soul have had a significant ripple effect across southern Italy, a region once known as Magna Graecia. Meaning ‘Greater Greece’ in Latin, it was arguably the first use of the term ‘Greece’ anywhere in the world – even in modern-day Greece itself – for a large collection of Greek-speaking cities. The city of Neapolis, straits of Syracuse, the shores of Brindisi, and the harbour of Otranto were all part of Magna Graecia, which was made up of hundreds of cities, towns, villages and settlements established by Hellenes from Ionia, Athens, and Corinth to name a few. The Greeks of the area once dominated the economy, social and political life through their overwhelming numbers, commercial dominance and achievements in mathematics, science and philosophy. It was a Greek heartland. And to this day, there are remnants of an ancient Greek minority who continue to speak and live like a Greek in what is a foreign, and at times hostile, environment. 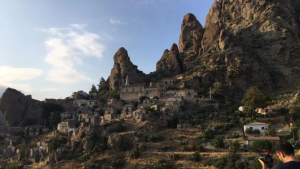 For any visitor to Calabria, Sicily or Apulia today, it is hard to fathom that the region had the Greek language at its core, yet in ancient and Byzantine times, Magna Graecia was as Greek as Athens, Constantinople, Cyprus, and Macedonia. This lasted until just a few hundred years ago, when in the 1500s the Catholic Church took over Constantinople’s aligned churches. The last Greek monasteries closed in the 18th century, while the last Greek Byzantine stronghold fell in 1071 in Apulia, ending direct Greek speaking rule from Constantinople in the region. Dark clouds have existed around the Greko since this act of betrayal by the Catholic Church and by the 1900s according to the older members of the community we met on our travels, it had become somewhat embarrassing for some to openly speak their dialect. Our first stop on the Calabrian Greko journey was an abandoned town, which was ironically under a dark cloud with rain threatening to spoil summer when we arrived. Driving through the countryside off Via Nazionale about 35 minutes from Reggio, I could feel the sense of history. When I visited in 2002, with my then girlfriend, accompanied by Carmelo, no one lived here and the town was essentially abandoned. 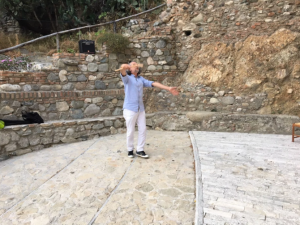 In a bid to immerse myself in the moment, I closed my eyes and tried to understand what the town would have been like with Greko speakers in abundance. For those who have yet to visit, imagine a place where time stands still; where a true living connection with an ancient and Byzantine past abounds. This is the way to understand Pendedaktilo and many of the other Greko towns. Bumping into a passerby again, like some Greek oracle, they shyly told us that there are just two people who live in the town. Intrigued, we made our way upward past some old abandoned dwellings sustained by their stone foundations set amongst a mountain background, which appeared to be five fingers – hence the Greko name of Pendedaktilo. As we entered the village square, it was almost like being in a typical Mediterranean town with children running around, a number of dwellings with electricity, a functioning taverna and souvenir gift shop selling locally made art. Operated by a friendly Italian couple, they revealed that in recent years the town had been turned into a tourist attraction promoting the heritage of the town and region. Pendedaktilo had been the scene of a modern Romeo and Juliet tragedy that saw many of the residents wiped out, and now here it was being sustained with visitors, a gift shop, and small piazza that lent itself to performances. There we were treated to the talents of Nino Racco Canstorie in a special private performance of a powerful one-man monologue, a couple of hours before the upcoming show. The town, just like the mysterious oracle who popped up, attracts a number of visitors daily, from tourists to neighbouring townspeople who take advantage of the town’s tranquillity, sitting 250 meters above sea level on the outskirts of the Aspromonte (White Mountain in Greko) national park. Founded in 643 BC by Chalcis, while it has always had structures and dwellings since that period, it hasn’t been continuously inhabited. An earthquake in 1783 resulted in most of the residents being moved elsewhere, including to neighbouring Greko town, Melito. As we drove away, you could see a cloud touching the top of the tallest ‘finger’ of the town, and I couldn’t help but wonder what the oracle would make of it. Our next destination was Bova Marina. 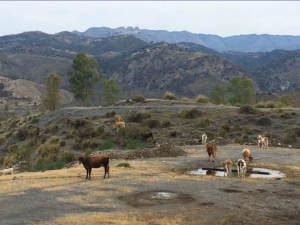 A town with a population of 4,000, it offers an invaluable glimpse into the Greko past and its future. 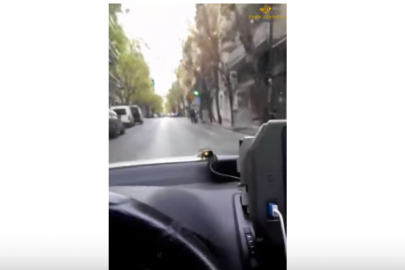 While there are very few Greek speakers in the town, with only 10 percent speaking it fluently, there’s no denying the Greek presence. Street names appear in both Italian and modern Greek, and there is the must-see Museo Agro-Pastorale dell’Area Ellenofona, the Mediterraneo Greek Restaurant, and several prominent Greek cultural organizations, including l’Associazone Ellenofora Jalu tu Vua, To Domadi Greko, and the Greek cultural association at Meditarraneo. 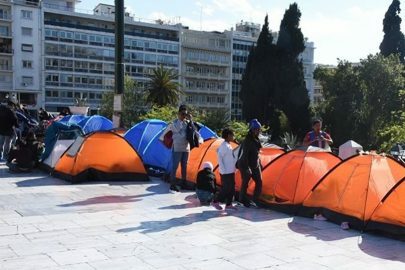 When I first visited in 2002 the attention we attracted as foreigners was akin to the mass hysteria reserved for INXS, and so word quickly spread that we were on the lookout for Greeks. Within an hour Carmelo Nucera, who has his own association in Reggio, came and found us. 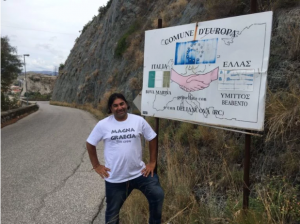 Born in the Greko town of Condofuri, he was the former Mayor of Vua, a smaller town with 800 people and 400 Greek descendants. Another person who met with me was local Greek teacher Phillipo Violi. This time we arrived under the cover of darkness on a bumper to bumper main street. Some animated Calabrians waited for us by our beachside accommodation at San Pasquale, welcoming us in Greko: KALÒS ÌRTETE, STON JALÒ TU VUA. As you drive outside and inside Bova Marina, one can’t help but smile at the old sign that welcomes you to the town in Greko and Italian with a Greek and Italian flag. When I first came to Calabria 16 years ago, I could see that the Greko language was almost at an end. Musician, Pandelis Danilo Brancati from Condofuri Marina had told me that over the last few decades, there had been a trend of “Greko speakers leaving the Greko areas in search of jobs and a better life. It is hard sometimes in Calabria”. 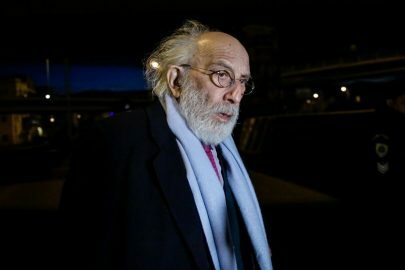 However, in recent years, the younger generation have taken on the task of championing the Greko language, with some 20 activists led by Maria Olimpia Squillaci driving a renaissance. Maria Olimpia’s energy and belief in the language has led her to undertake studies at Cambridge University and return to the region to teach Greko and ensure more people are learning it. 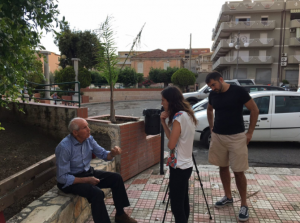 This has led to the campaign ‘If You Speak Me, I Live’, which features year-round workshops, online teaching, apps, and a filoxenia project to encourage more people to visit the region. It is easy to look up Google and read up on a region, but Calabria around the Greko area is a bit harder to locate. With the support of Maria Olimpia, who was in the middle of arranging her wedding, she was able to open a number of doors and take us to a range of meetings with elderly Greko, poets and younger people. No request was too hard, no annoying text for information or call was problematic – a reflection on the way she was brought up, and the warmth that Calabrians, especially the Greko, display to visitors. As part of our journey, we took along letters collected by Dr. Efrosini Delgianni, head of Modern Greek Studies at UNSW, from her Greek language students who wrote cards with messages in Greek. 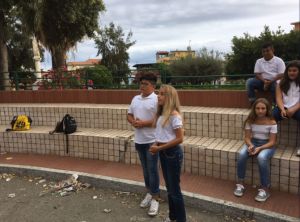 Dr. Deligianni was an enthusiastic supporter of the project and it was heartening to see university students willing to engage with children on the other side of the world. Meanwhile, in Melbourne, Anastasia Spanos, a teacher from Oakleigh Grammar, coordinated her students to write a number of letters, each with a personalized message in Greek. The messages came from the heart, encouraging the young Greko children of Calabria to maintain their language. While in Thessaloniki, Christina Michailidou, a primary school teacher and radio star on Boite Surreal Radio, produced with her students a number of letters and drawings, the colour and detail giving a beautiful and powerful message to the children in Calabria, one of summer and the hope that the language can be preserved. The letters were delivered in Bova Marina to the teacher of the students from a Greko town called Palizi. The children in return produced a brilliant hand-drawn and sketched A3 booklet, including pop-out information, to give an interactive element to the dialect, like a blue man with a diagram and words describing features such as eyes: ta maddhia (mouth), to stoma (nose), i cefali (head), etc. While an orange pop up features the 12 months of the year: O Jenari, O Flevari, O Marti, O Apriddi, etc. A number of drawings of the town were also presented, succinctly and brilliantly capturing the medieval style of the village with its Byzantine church. What made the exchange special was that the children performed a number of songs in the dialect for us in the town square. 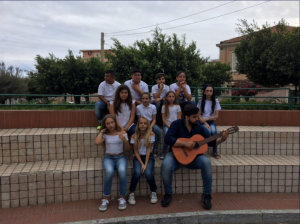 A touching experience, it gave us goosebumps, demonstrating the passion and hope for preserving the language amongst the younger generation in Calabria. 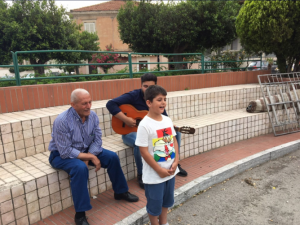 Danilo led the singing, and at one point was accompanied by a young boy and his Greko speaking grandfather, Don Salvatore. This, of course, is just a typical day in Bova Marina. 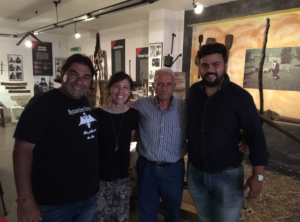 We also paid a visit to the Greko museum and had a drink with Greko speakers led by Don Salvatore, and sat with a grandmother and daughter all evening recalling stories of Greko from early last century. After a crazy day driving around the mountains and ending up in a range of Greko towns such as Vua and Roghudi, we decided to grab a Greek meal at Meditarraneo, of course. When we entered the tavern, the dark cloud was again hovering above. Along with ordering food in Greek, we quietly asked the staff for the owner. Turned out it was his day off, but he came to see us, and before we knew it, he was taking us upstairs to see his vast library of Greko and modern Greek books, a school for teaching Greko, and generously spent two hours past midnight talking to us. As we said our goodbyes and walked to our car, I noticed that the dark cloud had lifted. Similarly, I could see the dark cloud over the future of the Greko language lifting. And why wouldn’t it be, given how brilliantly the younger Greko speakers, combined with the older ones, are setting out to reverse centuries of dwindling numbers. * Billy Cotsis is a writer and filmmaker. His recent documentary is titled ‘Mykonos: The Other Side’.